Join us on the next Pilgrimage! Starting in the friendly little town of Kirkwhelpington, we spend six days exploring the varied countryside of Northumberland. Our route takes in the Simonside hills with their spectacular views, the county town of Alnwick and its famous castle, the beautiful Heritage Coast, and the castles of Dunstanburgh and Bamburgh. We visit the lair of the Laidley Worm (watch out for dragons) and St. Cuthbert’s cave. The highlight of our tour is our destination, the lovely island of Lindisfarne, where we join with other Northern Cross pilgrims for the spectacular Pilgrims’ Crossing on Good Friday morning. This leg is a day shorter than other Northern Cross legs, though that doesn’t mean easier – most days are 16-18 miles and terrain can be difficult. We arrange transport from Hexham to the start so that we can all meet together for a meal on Saturday evening. 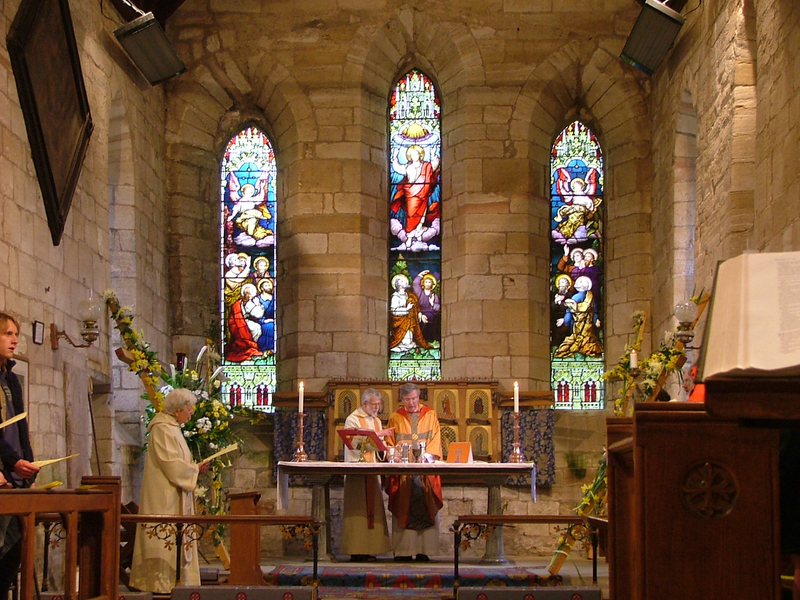 Monday sees us heading over the Simonside hills to the small town of Rothbury, where we are guests of the Rector and parishioners of All Saints Church. On Tuesday we leave Rothbury along the lovely River Coquet, stopping for lunch in Longframlington before heading north uphill along small roads and cycle tracks to Alnwick. Leaving Alnwick early on Wednesday morning, we enjoy a panoramic view of Alnwick castle across the river before heading out on small roads and paths to the little fishing village of Craster on the Heritage Coast. From Craster we pass by the ruined Dunstanburgh Castle, then on along Northumberland’s beautiful white sand beaches to the jolly seaside town of Seahouses, from where we can see the Farne Islands. After a pleasant stay in Seahouses including a fish and chip supper, on Maundy Thursday we continue our journey on footpaths to Bamburgh, where we pass by the castle before walking through the lair of the Laidley Worm on our way to Belford for a late lunch in the Blue Bell Hotel. After lunch, we continue on to our night stop in the Belford area, stopping by 4pm to prepare for our final meal together as a Leg group and a quiet contemplative service remembering Jesus’ last hours with his disciples /or evening Mass with foot washing and prayers. On Good Friday morning we walk our final ten miles to reach the Holy Island causeway, where all the Northern Cross pilgrims meet and together carry their crosses across the sands.